Today I’m getting personal on the blog. I wanted to share with you all, a little bit more about who I am, and just what I’m doing in my life currently. For those a bit newer around here, my name is Laura, I’m a Maine native currently residing in Dallas, Texas just trying to figure out what I’m doing with this life of mine. I am a wife, fur momma, gym rat, Cosmetologist, writer, and an American Council on Exercise Certified Personal Trainer…what a mouthful! Today I will be sharing my story of why and how I became certified! To be very specific, my passion lies in three things: 1. Teaching 2. Writing 3. Helping others. I have done sooo many different things in my short twenty five years of existence, but Personal Training has been the most rewarding of all. I truly enjoy helping others create a healthy lifestyle for themselves, it is simply the best feeling to be apart of that phase of change. The coolest thing I am able to do everyday, is make connections, and long-lasting relationships with people from all walks of life. Through personal training, I’m not only a teacher, I am a listener- a counselor, a coach, a cheerleader, and a leader. I absolutely love being a personal trainer, and being able to wear so many “hats” each day. I am one of five children, raised by two disabled parents, and I grew up very, very quickly. Growing up with two disabled parents, I had to also care for them, and that instantly made me want to take care of others, just like them as well. I owe it to them, that I am the nurturing, caring woman that I am today. It is in that, that I truly want to make a difference in the world, by helping others live their best lives. If that’s through personal training, or just simply starting that conversation of “tell me what your diet looks like” just being able to provide accurate information with my clients, is doing just that – planting the seed of change. I chose ACE simply because I had heard so much about it, from those around me. I had heard about two certifications constantly in the industry and that was: NASM, and ACE. I had compared and created “pro & con” lists, and I had even watched YouTube video’s comparing the two. It took me over a YEAR to finally choose, after researching, and second guessing myself, I chose ACE. Here are just a few reasons I chose ACE! Amazing package options – They have OPTIONS, and that’s what instantly drew me in. This is not a “one size fits all” type of certification. They have three options: Standard, Premium, and Premium Plus. I believe I chose the Premium package, which included: quizzes, assignments, videos, flashcards, helpful instructional videos, ect. I am NOT the type of person who can just read a book and fully absorb the material, I have to see, and sometimes even apply the knowledge before I fully comprehend something. So the fact that there are SOO many options in the packages was a definite selling factor for me. It’s flexible, and worked with my schedule – ACE is absolutely incredible! I had feared I wouldn’t be able to juggle my certification, as well as my full time job, marriage, obligations, ect. Luckily, ACE is all at your own pace! They set a general deadline for 6-9 months (?) where you have to at least schedule your exam. Fortunately, you can schedule your exam whenever you choose, if that’s a day after your deadline, or a year from that date…they’re THAT flexible! I chose to have my exam the week after that deadline, because I wanted to quickly enter the field. Comparably speaking, it’s less expensive, but get a better package – When I looked at NASM, I was shocked at the pricing. You would be spending at least $1k, and that’s at the very basic package. With ACE, you’re looking to spend anywhere from $300-$600 depending on what special they are currently running. When I took my exam, I walked in and thought I would fail…not gonna lie. I felt prepared, but with two textbooks, and a TON of new information, I felt I still had SO MUCH to learn. Typically in the fitness industry, you see people with a degree in Kinesiology, Sports Med, or something health related obtain a certification after their schooling. Being new to the fitness industry, I was overwhelmed with all there is to know about the mind, body, and everything else that goes into personal training. At times, I felt like I was destined to fail, but thanks to ACE and their support staff, I feel well prepared in the industry. Sure, I still have so much to learn, but I feel as though ACE was the best route for me to take, personally. I am so grateful to have entered this field, because it is truly so rewarding. I will be able to keep my certification so long as I do “continuing education” and I fully intend to keep it. 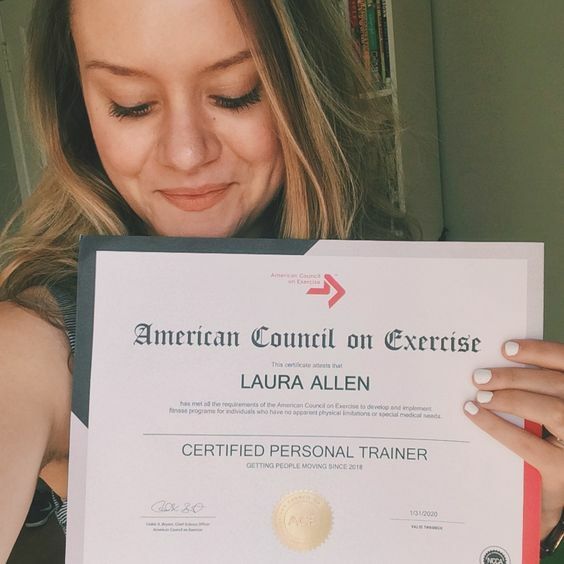 Through becoming an ACE Certified Personal Trainer, I feel so much more confident in helping others, as well as helping myself. Even if I’m not making a routine, or guiding someone through their own workout, I feel as though I workout with so much more awareness, as well as knowledge. I will continue to work in the “heath and wellness field” so long as I feel I can make an impact on the lives of others. If YOU are interested in looking at all the programs and certifications ACE has to offer, click on the banner on my sidebar! Do you have any burning questions about workouts, or weight loss? Do you need any gym advice? Let me know what you’re curious about in the comments below! "Why I Ditched Antiperspirant & Why You Should Make The Switch"